Trumpet vines, campsis radicans are much like mint plants. How, you ask? People either love them or HATE them with a passion. My experience, living in a northern climate with cold winters, is a good one. In fact, my I gave my mom a cutting from my husband's grandmother and it took years to really get off to a good start. Imagine my surprise to find out that some people compare this beautiful vine to kudzu and poison ivy! 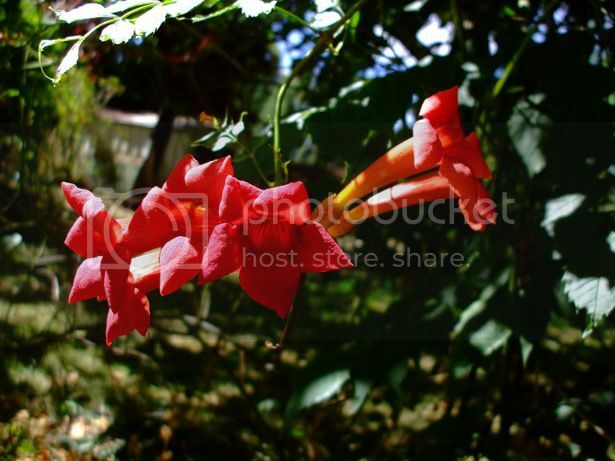 So what are the positives and negatives to the trumpet vine (also known as trumpet creeper vine or cow-itch)? It's blooms are beautiful in shades of red, orange and yellow and they attract hummingbirds, wasps and bees that are good for the garden plus birds in the winter if you leave the pods on the vines. It can be used as a screen for privacy, and it adapts to almost any soil, except heavy and wet. It transplants easily and can be grown from cuttings and is hardy down to about -30F (-34.4C). It can be grown in elevations as high as 5500 feet and it's drought tolerant. The problem is that in IDEAL situations it can be invasive to the point of creating enemies out of the most mild mannered home owner. What is ideal? Full sun, fertile soil, mild winters and freedom to roam. But yet, many of us treasure this beautiful vine and can't imagine NOT growing it despite some of it's faults. What can you do? -Do not plant it up against a house or building, though it is tempting. Try planting it against a fence that is between sidewalks, driveways or other areas like stone walls or paths that would contain it. -Try a method that is often used for mint. Plant your vine in a 5 gallon bucket with the bottom removed--or something similar, that will keep it somewhat contained. -Plant next to a telephone pole or light pole where it can climb and you can mow the grass around it regularly to head off shoots. -Deadhead the trumpet vine, AND keep it trimmed back in the spring and fall once it starts taking off. -Wear gloves when handling trumpet vine. Some people will get a rash from handling the foliage, so it's better to err on the cautious side. -Some modern cultivars are suppose to be less invasive than the trumpet vine found in the ditches and growing wild. -Do not use a tree as a pole for the trumpet vine to climb. Eventually it will strangle the tree. Use an actual pole or fence instead and again, prune in spring or fall, or even during mild winters. For many of us trumpet vine is a valuable plant for wildlife, and a sentimental plant that we remember from our grandmother's yard and garden. Know your climate, take precautions, and you can grow it too! It should be fine as long as the arbor is not next to the house or another building where the trumpet vine can grab on to that as well. 'Madame Galen' trumpet vine (Campsis X tagliabuana 'Mme Galen') is a little less hardy, depending where you live, and will grow slower than the standard trumpet vine if you are concerned about it being invasive. Once it really starts growing keep it trimmed so it doesn't go wild on the arbor. About the trumpet vines that don't bloom:Since I live in the warm, humid South, I don't plant trumpet vine myself. I have enough trouble trying to keep my jasmine from taking over! But I do remember reading an article about trumpet vines recently. You're right about the fertilizer promoting lush foliage and no blooms. I believe the article said that nitrogen rich soil and fertilizer was the problem. It cautioned about fertilizing things around the trumpet vine such as grass, etc. Don't fertilize the plant or, if possible, anything around it and see if it'll bloom. If all else fails, the article said, you can trim the roots back. The less nitrogen the plant gets, the more likely it is to bloom. ~M. Well, I myself am a "transplant' from IL and have been in AL for 17 years now....about 4 years ago we put up an iron gazebo in our lawn and planted 4 trumpet vines. The first year there were no flowers at all as it was just being 'established' in our soil. But since then, it produces clusters of beautiful red-orange color flowers that seem flourish. Our Bama climate is hot and dry with an occasional rain shower, plus we do water them once every 7 to 12 days in the early morning...we use Miracle Gro on them twice within the first month after the leaves come out. Once smaller branches or vines have flowered and the flowers have dropped off, we trim those branches back 3 to 5 feet since the flower buds only seems to appear on the newer growths. Once a branch of the vine thickens and is no longer pliable to twist into our gazebo trellis we cut that back too. This cutting back during the flowering season brings a lot of new growth that in turns keeps the vines flowering throughout the season. At the end of the season, when most vegetation is dying out, we cut back the main thick 'trunk' of the vines to approximately 12 inches above the ground for the winter season. ~JW. Here's a tip for the lady whose trumpet vine won't bloom. I heard this from an elderly lady when I was on a garden walk in mid-Michigan. Her advice, "Beat it with a broom!" Just as some trees like to have their trunks kicked, trumpet vines can be stubborn and may have to get knocked around a bit! While I don't have a trumpet vine myself, I've passed this advice along to three of my friends who do. Believe it or not their vines now bloom extremely well---the second year for one friend and the third year (since the beating) for the other two. (One kicked the trunk instead of using the broom!) Note: I understand it may work for some other vines with a woody trunk too.